We didn't plant a garden this year. It's been so hot that even the trees in our yard are looking sunburned. The usually hardy and spreading basil plants are drying as they grow. The thing that depresses me most is not having fresh tomatoes to pick for suppertime. I received a big box of Pomi products just as I was bemoaning my tomato-lessness. I'd never tried the brand before and was anxious to see how the paperboard containers did with keeping them fresh tasting. The cartons are aseptic and BPA free, plus they're made from 75% renewable resources and are also recyclable in many areas. Oh, they also stack really well in the pantry. I put the Pomi Chopped Tomatoes to the ultimate summer taste test: Gazpacho! 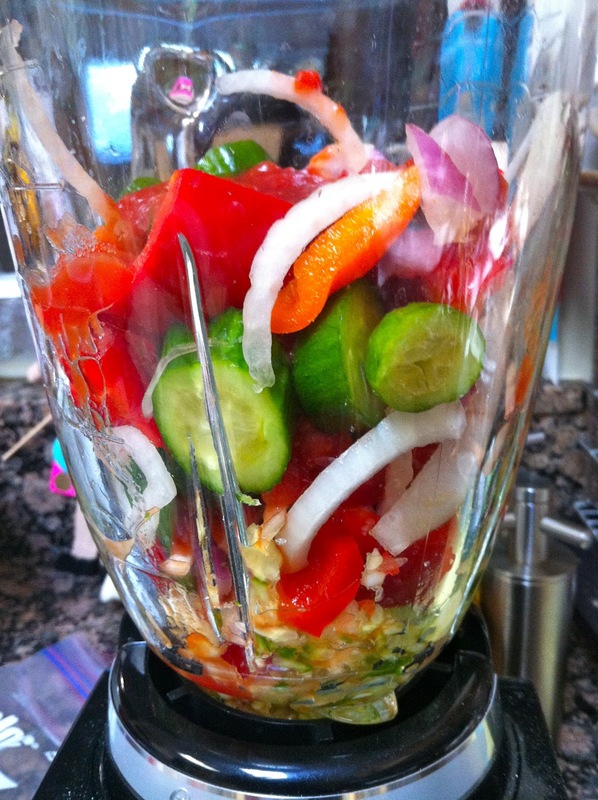 I love the way the veggies look in the blender. So colorful. One of my favorite movies of all time, Women on the Verge of a Nervous Breakdown, has a fabulous blender gazpacho sequence. I decided against adding copious pills to mine, as they did in the movie, and opted instead for extra garlic because I like a spicy gazpacho. After I blended it, I added a dollop of Greek yogurt instead of the sour cream suggested. I was impressed- there was no way to tell this gazpacho was not made with fresh tomatoes. It was delicious and refreshing. Perhaps that is why esteemed chefs and organizations such as the Viking Cooking School keep Pomi products on hand. Their tomatoes are packaged without preservatives or additives, hours after they are picked. It's a convenient way to have "fresh" tomatoes at your disposal for any kind of dish. These will definitely become pantry staples in our household. There are many recipes to try on Pomi's website. 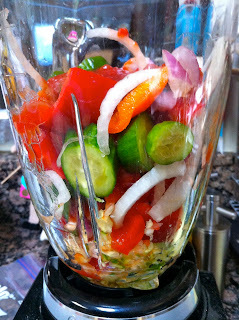 Here is the one I used for the gazpacho, although I used an entire head of garlic. CAUTION: don't breathe on anyone after eating! of summer and the great taste of Pomi Tomatoes. Add the vinegar, olive oil, salt, and pepper. Mix well and chill before serving. We love to leave our in the refrigerator overnight to let the flavors develop. Serve with a spoonful of sour cream or ricotta floating in the middle. In accordance to the FTC Guidelines and the WOMMA Code of Ethics, I am disclosing that we received the Pomi products pictured in order to facilitate this review. No other compensation was provided. All opinions are, as usual, entirely my own. I want to try this!! I sold my blender in the move, and that's still one of those things I haven't bought... and drooling for this recipe now and might go and buy a blender today..